That is the type of generation we live in according to Earl Palmer, a much-respected writer and pastor. Integrity has taken a beating in this modern world of ours, as we know from watching the nightly news. Even the religion world has had its share of scandals. Somehow our Christian senses have been deadened by all the gifts and noise. And somehow it has made our quest to live a life consistent with the gospel more and more difficult. 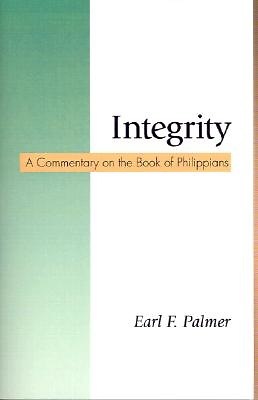 But Earl Palmer believes that Paul, in the book of Philippians, has much to say to our generation about integrity in life; about living our daily lives b worthy of the gospel.b Palmer, with his gift for expository teaching, unfolds the insights of this short letter and offers them to us as a guide to the kind of life, full of integrity and depth, we all want to live for Christ. With questions included for study and reflection, this book is valuable for either personal or group use.